The Mason Business Center lots had to remain available to employees throughout construction. So . . . how challenging can it really be to pave some parking lots? Ubiquity and commonplace function serve to make such aspects of our infrastructure all but invisible—even as they are treated to the same pummeling use as all other forms of paved surfaces. A recent project in Mason, Ohio, that involved a series of large parking areas in a busy business center, as well as the ring road that feeds and serves them, exemplifies precisely how challenging rehabilitation and recycled pavement work can be, and as a result has earned a Roads & Bridges/ARRA Recycling Award. The Mason Business Center (MBC) serves as a research and product development laboratory for consumer products. As the result of the closure of a nearby facility that would cause an expansion of the MBC, a facility-wide pavement rehabilitation program for the center’s existing asphalt pavement was conceived. An initial and overarching challenge would be that the facility would need to remain open and accessible during the entire construction process. In order to create and maintain an accelerated construction schedule, a comprehensive determination of subgrade soil conditions was performed in advance of recommendations for pavement design. The overall project site consisted of 14 lots totalling approximately 63,200 sq yd, along with an access road of 2,000 linear ft. Based on the subgrade soil conditions in each lot, unique mix designs would be required, in order to stabilize the subgrade for extended pavement life. Consequently, Atlas 10 brought in SME, of Shelby Township, Mich., to assist with the geotechnical evaluation of the site. Multiple subgrade evaluations were made to determine appropriate mix designs for each lot. 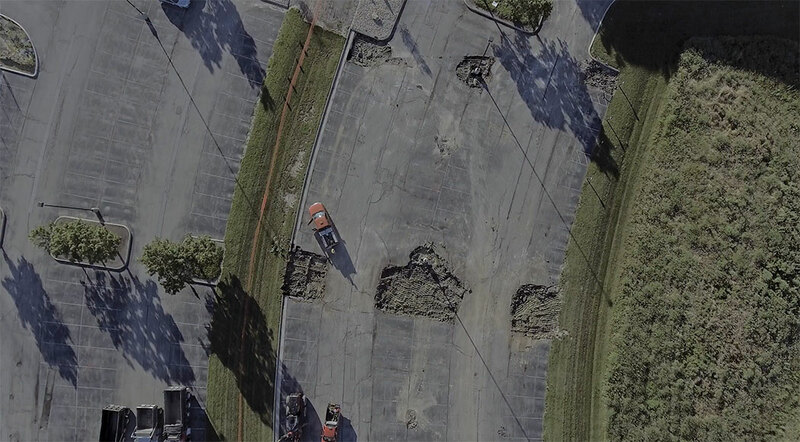 SME employed a nondestructive falling weight deflectometer to test the support provided by the subgrade to the pavement section, as well as determine how strong each pavement section was. That strength was then generated into a structural number (SN) for that section. The subgrade directly affected how each pavement section was going to be rehabilitated. Because the subgrade was variable and, generally, poor to very poor at supporting the pavement structure itself, and due to the tight construction schedule requirements, SME recommended full-depth reclamation (FDR) in many places. The geotechnical evaluation demonstrated significant subgrade/soil problems to address. The reclamation, restabilization and paving of the lots and road would require multiple players. Crews employed a Wirtgen WR250 stabilizer for the pre-pulverizing and stabilization work, as well as Terex spreader trucks and pneumatic tankers for the PC. A padfoot vibratory roller came up directly behind the stabilizer, and everything was sealed up with a Cat double-drum static smooth-drum roller. Once the site was balanced and graded to where it would end up, crews then spread PC on top of the reclaimed material and went back through with a water truck to get the PC to hydrate and provide the strength needed for the subgrade. Subgrade soil stabilization made advantage of the material already on-site to give the portland cement binder a substance it could adhere to readily. Neyra Paving, out of Edendale, Ohio, came on to complete general earthwork and asphalt paving. After adding or constructing much of the curbing on the lots, the wearing surface courses were ready. Neyra had to discriminate between the heavy-duty role of the access road and the relatively light duty of the lots themselves in layering the lifts. In all areas, the base course was a 19-mm PG 64-22 100% crushed aggregate, using 30% RAP plus Aramid fibers, while the surface course was a 12.5-mm PG 70-22 100% crushed aggregate, with 15% RAP plus Aramid fibers. Lifts levels on the road were slightly thicker than in the lots: 3 in. of base and 2 in. of wearing course vs. 2 in. of base and 1.5 in. of wearing course. 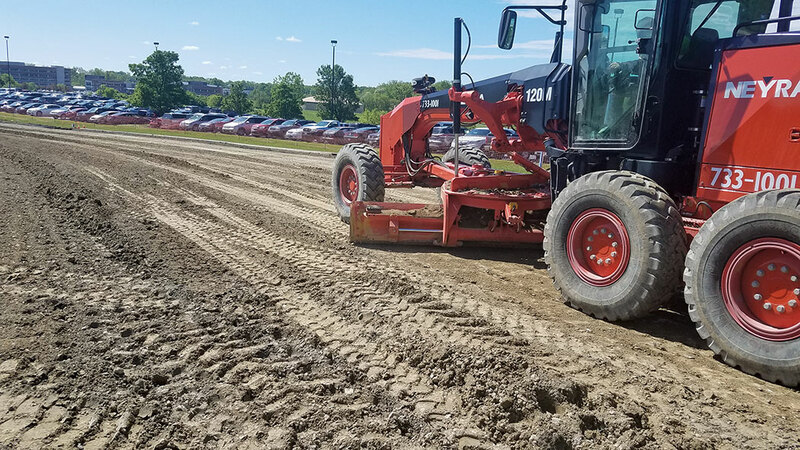 A Cedarapids 362 paver was employed on the heavy-duty and wide open areas followed by a Caterpillar CB7 18,000-lb roller and a Caterpillar CB34 8,000-lb roller for compaction and finish rolling. On the smaller, tighter areas, a Lee Boy 8515 paver followed by Caterpillar CB34 rollers were used for compaction and finish rolling. 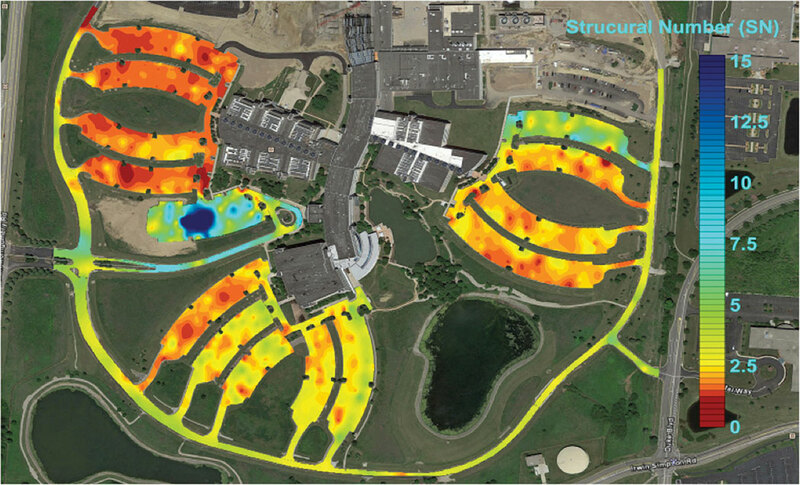 Density requirements were significant—94% for the base and 98% for the surface—but were achieved. All told, the MBC project came in $782,000 under budget and on schedule. The Mason Business Center Rehabilitation Project also was recognized as a demonstrator site by the U.S. Green Building Council, due to the sustainability achievements made during construction.